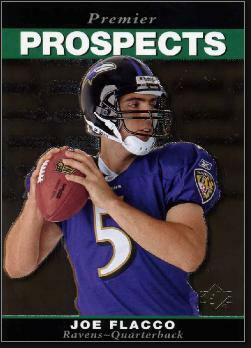 Joseph Vincent Flacco was born in Voorhees, New Jersey on January 16, 1985 to Karen and Stephen Flacco. Stephen had played college football and baseball at the University of Pennsylvania. Joe was a big athletic kid with a strong arm who excelled at baseball. Yet, growing up in the twon of Audubon, he did not play organized football until middle school. Joe attended Audubon High School and was a part of a good Green Wave football team. He was a three-sport athlete at the school, playing football, baseball and basketball. As a quarterback, he had the fourth-most passing yards in South Jersey prep history with 5,137—and the most yards in one game, with 471. Joe accepted a scholarship from the University of Pittsburgh in 2003. He was red-shirted his first year and was a backup on the varsity his second year, when he only played in three games and had just one completion for 11 yards. Unhappy at Pitt, Joe decided to transfer to the University of Delaware for the 2005 season. The University of Pittsburgh however, didn't allow him the free transfer waiver, so he had to sit out the year. In 2006, Joe finally got to play for the Blue Hens and became a star. He set 20 different records and led Delaware to the 2007 Football Championship Subdivision (FCS—formerly known as Div. 1 AA) championship game in his second year. The Blue Hens lost that game to Appalachian State. Come draft day in 2008, the Baltimore Ravens took Joe 18th overall. He was the first quarterback from a Division 1 FCS school ever to go in the first round. The pick had originally belonged to the Houston Texnas, but they traded it for the #23 pick plus two picks in later rounds. Joe's rookie season was very impressive. He threw for 2,971 yards and 14 touchdowns, and was voted Rookie of The Year. He led the Ravens to their first AFC Championship game since 2000. They lost to their bitter rivals, the Pittsburgh Steelers, 23-14. In the eyes of most football fans, Joe's job as a young NFL quarterback was to simply "manage" the Baltimore offense. But he did much more than that. Joe displayed a powerful arm and led the Ravens deep into the playoffs year after year. In 2009, he passed for 3,613 yards and 21 touchdowns. In 2010, Joe threw for 3,622 yards and 25 touchdowns. 2011 was another good year for Joe. He passed for 3,610 yards and 20 touchdowns. Joe set an NFL record by starting and winning a playoff game in each of his first four seasons (he would extend that mark to five in 2012). The Ravens returned to the AFC Championship game in 2011 and nearly beat the New England Patriots. Towards the end of the game, Joe connected with Lee Evans in the end zone for what should have been the game-winning touchdown, but Sterling Moore swatted the ball away. Two plays later, Billy Cundiff missed the game-tying field goal, and with that Baltimore's Super Bowl hopes disappeared. In 2012, the Ravens took their final step under Joe and made it to the Super Bowl. He set career highs in completions and passing yards along the way, and was at his best in a second-round playoff match-up with Peyton Manning and the Broncos. With less than two minutes left, he threw a 70-yard game-tying TD pass to jacoby Jones to force overtime—and the Ravens went on to win. They beat the Patriots in the AFC Championship and then defeated the San Francsico 49ers 34–31 to become NFL champs. Joe was named Super Bowl MVP. The Ravens rewarded Joe by making him the higest-paid quarterback in league history with a six-year deal worth more than $120 million. That distinction didn't last long, as the Packers and Falcons topped that number for their QB’s, Aaron Rodgers and Matt Ryan. During the season, Joe established new personal bests with 362 completions and 3,912 passing yards. He connected for 19 touchdowns but also had his worst year in terms of interceptions, with 22. After starting the year with a sluggish 4–6 mark, the Ravens rallied to win four straight. However, they lost their final two games badly to the Patriots and Bengals to miss the playoffs. Joe rebounded to have a good year in 2014, establishing career-high totals in touchdowns (27) and passing yards (3,986), while lowering his INTs to 12. However, with Ray Rice suspended, Joe was minus an important weapon and although Baltimore managed 10 wins and a return to the playoffs, the Ravens fell in the second round to the Patriots. The 2015 campaign was Joe’s most disappointing. The Ravens struggled to win and Joe injured his knee in a November game against the Rams and missed the rest of the year. He finished with 2,791 yards and 14 touchdowns in 10 games. Things improved in 2016, as Joe and the Ravens got a quick start. However, Baltimore missed the playoffs for the second year in a row with an 8–8 record. A winless October and losses in three of their final four games sealed the Ravens’ fate. Joe, who signed a three-year extension before the season, established career highs with 436 completions and 4,317 yards.